Today we will discuss one of the worst mistakes you can make in a workout with weights, and yet is one of the two most common mistakes of all. We are talking about putting first and foremost on the chest and arms while the legs are underestimated as well not exist (the other error so you know is to try super heavy lift with bad technique). But the problem arises when that becomes the only goal in training. And do not take a genius to realize this problem. Go to the gym on Monday and all w benches and bars will be occupied while the squat racks are empty or with some comfortable putting the bar there for exercise your biceps. If your goal is to develop a muscular body, big arms and a protruding pecs then you have to train your whole body, especially the legs. If you disregard it training legs you are missing a potential to gain muscle in your whole body is immense. The reason? When you train the major muscle groups of the legs (especially when you exercise with two exercises, the squat and the dead lift) that stimulates your central nervous system to release large amounts of testosterone and growth hormone. In other words when you do squats and dead lifts you are supplementing naturally with the hormones that your body needs to develop ALL the way you want it to. This means that if you train your legs this will also benefit your biceps, your pecs and all other muscles that interests you develop. So if you want to maximize the development of your body and if you do it as fast as possible then you have to be sure to include leg workouts the same way you do with your favorite muscles. 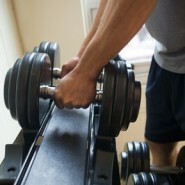 A good exercise routine is one that does not neglect a single muscle group. Forget one and not just aesthetically notice one training and lack of training of the other but you favor the rapid emergence of injuries and muscle imbalances that do not want to suffer in the name of being someone who just has big arms and chest. Start slowly. Training legs is most intense for what should be done slowly and with little weight to start. Never, ever sacrifice the art. Not that emulate you stimulate the development of the hormones you need movements, what do you do when you train properly with good weight and good technique. Your essential exercises are dead lifts and squats. Those are the main exercises. Then do press exercises and stretcher sitting and lying. Nor forget to exercise it calves.